This Psalter is named after one of its owners, John Grandisson, who was bishop of Exeter from 1327 until his death in 1369. It was adapted for his use, having originally been made for someone who perhaps lived in the area of Chichester. 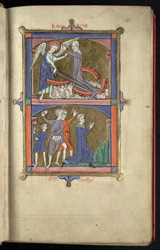 The upper register shows St. Catherine, saved by an angel from her torture on spiked wheels, who also strikes down her torturers; the lower scene shows the Stoning of St. Stephen.